From 2005, writer/director John Turturro’s (The Big Lebowski) Romance & Cigarettes is an ambitiously original and audaciously contemporary genre mash-up of romantic comedy and musical drama and, above all, a fine showcase for its great cast. 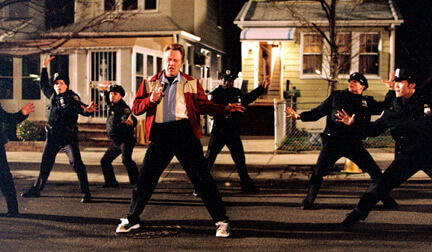 Christopher Walken and company are dancing in the streets in Romance & Cigarettes. Romance & Cigarettes is the story of a marriage on the brink of collapse. A mid-life crisis has given Nick (James Gandolfini, TV’s The Sopranos), a Queens, New York ironworker a roving eye much to the bewilderment of his wife Kitty (Susan Sarandon, Tammy). The object of Nick’s affection is Tula (Kate Winslet, A Little Chaos), a romantic in the truest sense of the word. Paying homage to classic Hollywood musicals, borrowing from The Singing Detective and Pennies From Heaven, a jukebox musical where heartfelt feelings are verbalized not through spoken word but through song and dance. From Dusty Springfield (“Piece of My Heart”) and Elvis Presley (“Trouble”) to Cyndi Lauper (“Prisoner of Love”), the musical numbers are as eclectic as the characters mouthing them. Romance & Cigarettes also features performances by Steve Buscemi (TV’s Boardwalk Empire), Bobby Cannavale (Blue Jasmine), Mandy Moore (Love Wedding Marriage), Mary-Louise Parker (Howl), Aida Turturro (TV’s The Sopranos), Christopher Walken (The Dogs of War), and Elaine Stritch (TV’s 30 Rock).